( MAIN PICTURE): Actor Pat Nolan. 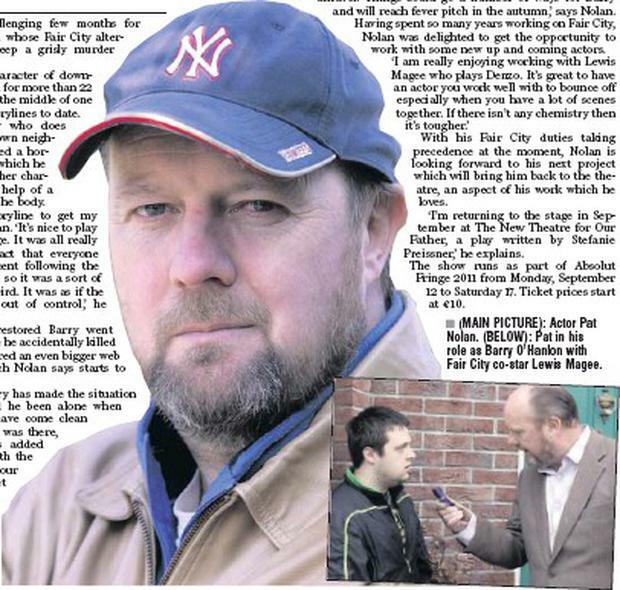 (BELOW): Pat in his role as Barry O'Hanlon with Fair City co-star Lewis Magee. IT HAS BEEN A challenging few months for Conary actor Pat Nolan whose Fair City alterego is struggling to keep a grisly murder secret. Having played the character of downtrodden Barry O'Hanlon for more than 22 years, he is currently in the middle of one of his most gripping storylines to date. Usually the nice-guy who does right by all his Carrigstown neighbours, Barry has endured a horrendous period during which he accidentally killed another character and enlisted the help of a resident thug to dump the body. 'It's really been a storyline to get my teeth into,' explains Nolan. 'It's nice to play the bad guy for a change. It was all really well set up and the fact that everyone knew Barry was innocent following the paedophilia accusations so it was a sort of excuse for his acting weird. It was as if the Chinese whispers got out of control,' he adds. With his character restored Barry went back to normal but once he accidentally killed his friend Sarah he entered an even bigger web of lies and deceit, which Nolan says starts to unravel this week.
' The thing is that Barry has made the situation worse for himself. Had he been alone when Sarah died he might have come clean but the fact that Denzo was there, unknown to him, has added another dimension.' With the tides turning in his favour Barry is starting to get comfortable leading his double life but things are about to come crashing down. With his Fair City duties taking precedence at the moment, Nolan is looking forward to his next project which will bring him back to the theatre, an aspect of his work which he loves. 'I'm returning to the stage in September at The New Theatre for Our Father, a play written by Stefanie Preissner,' he explains. The show runs as part of Absolut Fringe 2011 from Monday, September 12 to Saturday 17. Ticket prices start at €10.